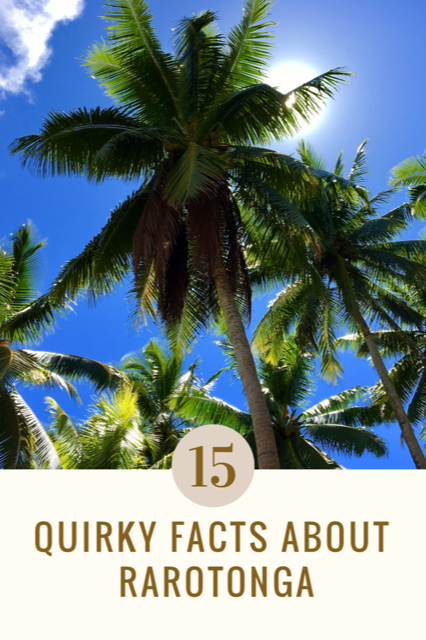 This list of quirky facts is a collection of things that make Rarotonga special, things that I miss when I'm away and the things that will make your holiday both unique and memorable. 1. A lagoon that completely encircles the island. This makes Rarotonga a reef protected island and if you’re like me and can’t stand swimming in rough ocean with waves crashing on the shore, Raro is the place to swim. It’s the only ocean that I love to swim in. The waves crash on the outer reef which circles the island, leaving the turquoise lagoon in between land and reef, calm and warm. The reef distance from the shoreline varies at different points around the island, in some parts the reef is only metres from the shore but in other parts up to a few hundred metres away. This leaves wide open spaces to swim and snorkel calmly and explore the coral formations, home to fish, sea urchins, sea cucumbers, star fish, moray eels and clams. 2. So many shades of blue. Here you will see the most shades of blue you've ever seen. From sky blue above the horizon to the deep blue Pacific ocean below the horizon. Just next to the white crashing waves on the outer reef is the most vivid turquoise blue lagoon which varies in shades, depending on the sunshine and time of day. All shades can be seen when looking out from the beach, driving around the Island or from high up in the mountains, while changing throughout the day. 3. Shoes are optional, but reef shoes are advised. Get grounded and leave your shoes on your door step. Nothing feels better than walking around the island in bare feet, especially after it has been raining and the ground is still wet. Get your feet in puddles before it drains away, it’s so grounding. 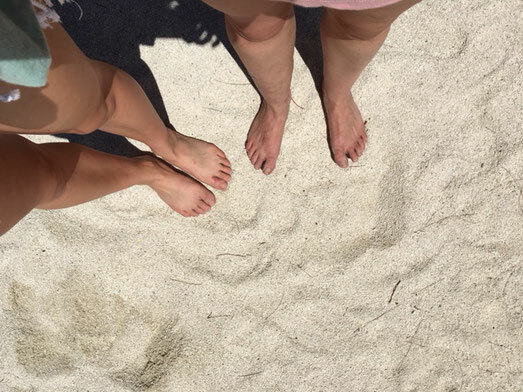 While bare feet are ok on land and beach, it’s recommended to always wear reef or aqua shoes in the water. While it may not happen to you, there are stone fish in certain parts of the lagoon especially in the rocky areas. You don’t want to step on one of these poisonous coral reef dwelling nasties. 4. Only 3 kinds of outfits required. *A swimming outfit, as you'll probably spend a lot of time swimming and snorkelling in the beautiful lagoon or sunbaking on the sand and poolside. *A casual day outfit, to explore the island. As it is always warm (between 25 – 29ºc) you wont need to wear a lot. Shorts and t-shirt/singlets or a simple dress are fine for every day wear. *An evening outfit, for dressing up a little. Whether you’re dining out at a restaurant or drinking at a bar, you may want to dress up a bit (but not too much) to feel beautiful. Girls, finished the look off with a simple flower in your hair or head ei. Perfect evening island wear. For guys, a simple shirt with your shorts for evening is fine. See our Essential packing list for Cook Islands. Get a copy of this for yourself. It has all the basics, everything you will need to bring. Print it out for free. The squishy vacuum cleaners of the lagoon. Yes, they’re a bit ugly but harmless. They are however doing a very important job living on the ocean floor consuming sand, plankton, algae and waste particles and then pooping out beautiful clean sand keeping the lagoon clean, almost like a filter. 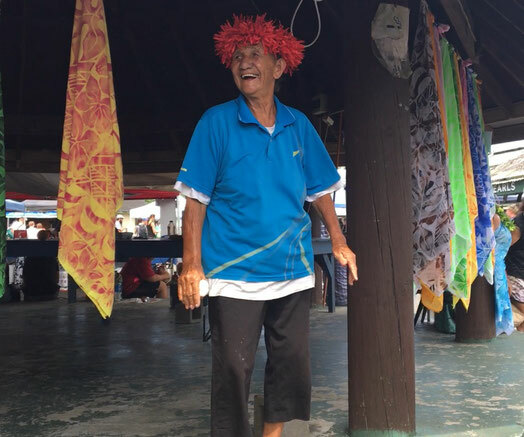 Locals do seasonally eat parts of the sea cucumbers but don’t just go and cook one up. This is an intricate process as they actually slice them open and remove the innards (gonads) which are eaten raw and sometimes cooked in a certain dish. Locally named rori, the sea cucumbers are then placed back in the lagoon to recover and grow new organs. Amazing little creatures. 6. Free range chooks and dogs. Here on the island, you will see a lot of roosters, chooks and their chicks all roaming around freely. Very cute to see and their crowing and chirping is not annoying at all. Sometimes mum chook can get a little vocal when humans get too close, protecting and guiding her chicks. 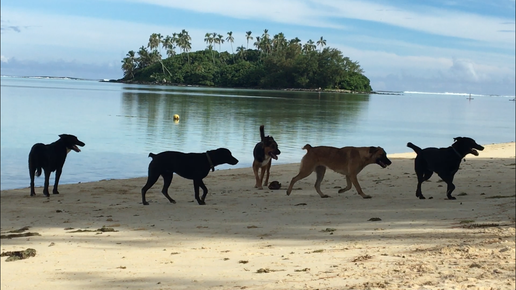 You will also see a lot of friendly dogs wandering around. Some are owned, some not, usually visible by registration and a collar. Feel free to pat them as they are very friendly. Most won't even sniff you as they are very socialised and not at all defensive in nature. Just be wary of where they are though and watch they don’t dart across the road if you are driving around the Island. These very cute creatures are harmless and mainly found in small shells along the beach. 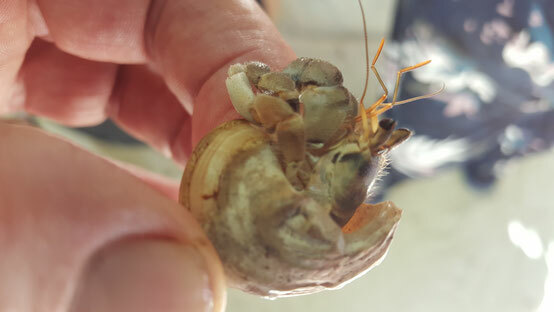 If you happen to see a shell moving by itself you'll find a hermit crab inside. Pick it up and put it in your hand and it may come out for a look. Try to not drop them though as you might break his shell and home. Hermit crabs will find new and bigger shells to move into as they grow so leave any shells you find as a hermit crab may one day need it. I found the biggest hermit crabs to be on the East side of the island roaming around at night on the grassy areas just off the beach looking for food and mates. Some were the size of my palm. Also expect to see geckos while on the Island. 8. Crossing the date line. If traveling to the Cook Islands from the West (Australia & New Zealand) you will be crossing the International Date Line which runs between the other pacific islands of Samoa and American Samoa lying just to the west of the Cook Islands. On arrival, you will have gained some time. Each time I have visited, I have arrived before I'd left Australia. It's like going back in time. This can be a little confusing so make sure you’ve booked your accommodation with this in mind. Book the extra night for your arrival so you're not left without a bed when you get here (usually in the middle of the night). When leaving Raro to go home, you will lose a day when you cross back over the Date Line, arriving home a day after you expect to. If having a connecting flight in New Zealand be aware of times for connecting flights, on the correct day. 9. They're the happiest people. These guys have a very happy nature with big smiles and an infectious laughter. You will see road workers smile and give you a wave as passing by. Locals yell out Kia Orana from the back of utes while driving along. We were disturbed one day by council workers, on the beach cleaning up using a bobcat. While feeling bad for being noisy, one of the men sent a younger guy up in the bucket of the bobcat to the top of a coconut tree to get 2 green coconuts for us. He then husked both nuts and opened one for us to drink as an apology. We didn’t mind the noise at all because they were cleaning up the beach but we were very grateful and accepted the nuts. No one ever seems bitter or grumpy and who would be, having this Island as their home? I would be happy everyday too. The Cook Island drum, or Pātē as it is called locally, come in all sizes and sound great alone or with other sized drums for a magical sound of beats. This is the Islands main instrument for music and also provide beats for dancers to swing their hips to. Watching and listening to a number of drums playing together and at a high b.p.m. makes you want to dance along. Locals can be heard practicing drums and Island ukulele’s from their homes and also heard at ‘Island nights’ playing for the dancers and tourists. They’re so great to hear. 11. Optional seat belts and baby car seats ...just don’t speed. It’s not a legal requirement to wear seat belts in Cook Islands. Baby capsules and booster seats are not seen. Common sense is used instead. With the maximum speed of 50km/h, no one is in too much danger of being killed from not wearing a seat belt. Babies and toddlers are held by another passenger and sometimes the driver, while driving. This did make me look twice when I first saw it but when I realised the police don’t even care about this I completely relaxed and realised it was like this at home when I was a baby and it was less populated. Don’t speed though. The police are quite strict about this and are always enforcing this law around the Island, handing out fines (or bills as they call them) up to $200 …as my partner found out first hand, woops. These fines must be paid for in cash only at the police station in Avarua. With scooters on the Island, it is not unusual to see young kids sitting behind a parent on a scooter or motorbike with a sarong tied around both of them for a bit of security. 12. Tourists can roam anywhere that is not privately owned. You are allowed to enter resorts, cemeteries, school grounds, church grounds and any part of the beach as long as you don’t use private land to access these areas. Use different resorts’ restaurants, pools and beaches. Wander through other public places, like church grounds and cemeteries. If you see any fruit trees in these areas, tourists can pick a piece of ripe fruit to eat. Just don’t be greedy. Coconuts can also be found lying on the ground all over the Island. Don’t run over any on the road and don’t stand or park under any coconut trees as coconuts may fall from them. Over 11 days on my last stay here I witnessed 5 fall to the ground with a massive thud. I would hate to see one hit anything. 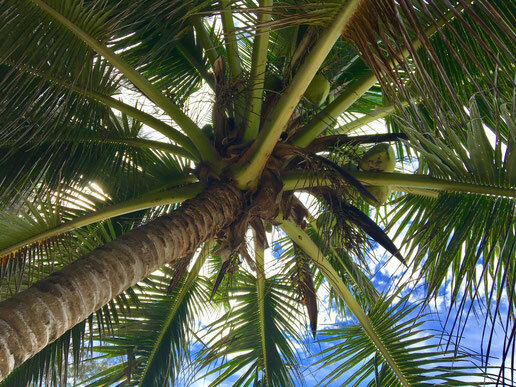 Beware of falling coconuts, stand under these at own risk. 13. Plane watching & a jet blast. 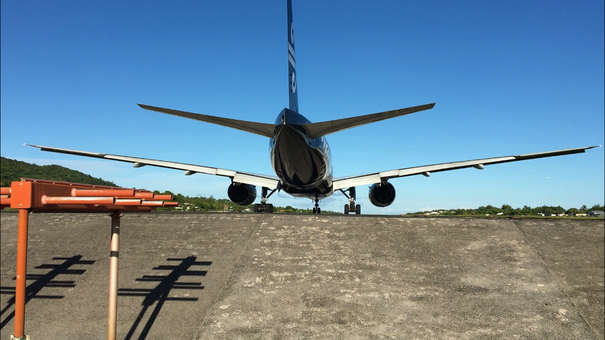 Being a small Island, you'll encounter planes while on holiday, especially if staying on the West side where planes approach coming in for landing. The screaming jet engines can be heard giving you enough time to look out to see them about to land. Drop in to the airport and get some arrival times to stand ready at the end of the runway and watch them come in and fly directly over head before touching down. Probably the closest you’ll ever get to the belly of a plane. For a bit more excitement (and danger) stand at the other end of the runway for a departure and feel the jet blast. After a friendly wave from the pilots you will be directly behind the jet engines. Hang on to the fence for an insane 10 seconds before take off. So hot and stinky you’ll smell jet fuel up your nose all day but what a rush. The airstrip is short and directly next to the ocean so the take off is fast and intense. Feel the extreme power of a Boeing 737 or Airbus 320. Don’t forget to park your hire car or scooter well away from the blast though. Who needs data on a holiday anyway? Well maybe to share your stunning photos on Instagram and Facebook to make everyone at home jealous. Switch off for most of the day, as WiFi is not available all over the Island. The only free WiFi is upon arrival and departure in the airport terminal where you can access 15 minutes for free. Just enough time to post your arrival to family and social media accounts before you can forget about the outside world and really enjoy your stay. If you do need WiFi, you can purchase different data amounts from Bluesky and access this at one of the 300 hotspots across the Island. These seem to be available at all accommodation and restaurants dotted around Rarotonga. This is a massive growth of technology from just 20 hotspots in 2016 to 300 in 2019 so it’s getting more accessible. 15. You'll experience scenery overdose. Everywhere you look, your eyes are in awe and met with the best scenery. 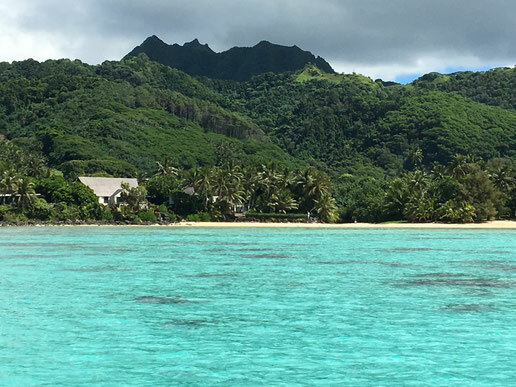 The turquoise lagoon is something else, especially between the hours of 10am – 3pm when the sun is high in the sky. Palm trees lining the beaches and dotted around the island. Central mountains that rise up abruptly. Gorgeous sunrises and sunsets with so many colours that change within seconds. My favourite view is when you are in the lagoon looking back to shore: The turquoise lagoon backed by a thick row of coconut palms and lush green mountains above. The best tropical view you’ll ever see while floating in the water all day, you’ll think you’re in heaven. 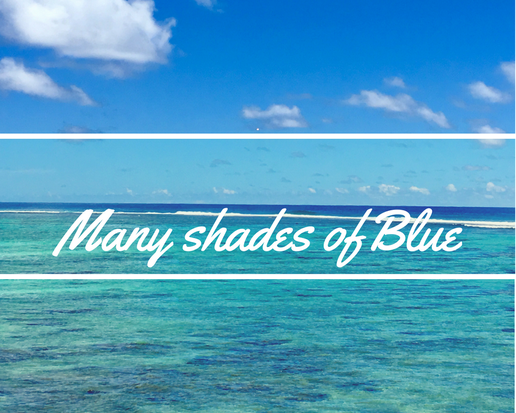 Comment below if you've found another quirky fact about Rarotonga. By sharing your experience, you may open up an opportunity for other travelers to experience.